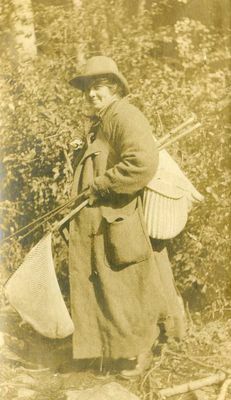 "Woman With Fishing Gear "
A black and white photograph of a woman fisherman standing outside, holding fishing equipment such as a net and poles. The photo is included in an album that was given to Maine guide Henry McLeod in 1907. From the Lovejoy-McLeod family papers.